Question: Our older refrigerator seems to be much colder than normal. The dial on the refrigerator setting dial has the numbers 0-9. The problem is that there is no indication of which number (higher or lower) to set the dial to make the refrigerator colder or warmer. Generally, what number is coldest on a refrigerator? The highest number or the lowest number? Quick Answer: The higher number is the coldest setting. 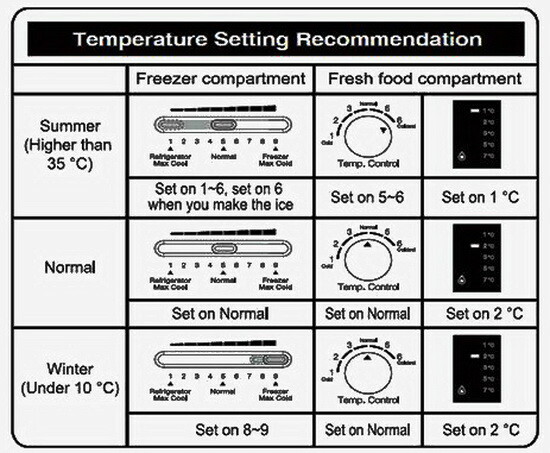 Most refrigerator temperature settings are controlled with a dial or slider. They are sometimes labeled 1 through 5 or 1 through 9. If you are not sure what to set it to, then set it somewhere in the middle. If the dial is numbered 1 to 5 set it on 3, if the dial is numbered 1 to 9, then set at 4. 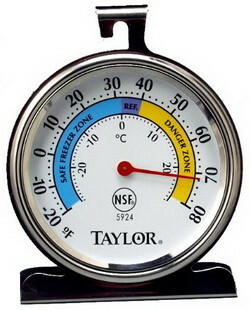 USUALLY the higher the number on the temp control dial, the colder the temperature your refrigerator will get. If your drinks and food are not as cold as you like, set the temperature dial up one number higher. If it is at 3 and you want your food colder, set it to 4 and test 12-24 hours later to see if your food is at the temperature you desire. Most older refrigerators will have a simple temperature dial control setting as seen above. Most Kenmore, LG, Samsung, Maytag, GE, and newer Whirlpool refrigerators have an actual digital readout that displays the exact temperature. These newer refrigerators still have temperature control sliders, knobs, dials, and digital touch pad controls. This makes it much easier to know and control the exact temperature in your fridge or freezer. A thermometer like the one above is perfect to keep in your fridge to know exact temp. An easy way to check to find out the exact temperature is to use a simple inexpensive thermometer in the refrigerator. Most refrigerator controls do not show the actual temperature so using a thermometer is a good idea. Your refrigerator should be below 40 degrees F to be safe. The best temperature to suit just about any refrigerator is ideally at 37 degrees F.
If the settings on your temperature control dial seem to be making the fridge too cold or too warm, use the thermometer reading to adjust the settings dial until you have the best temperature. Allow 12 to 24 hours between each adjustment. Low (colder) temperatures are key to prevent bacteria growth and to keep your food fresher longer. Here is information on storing food at safe temperatures. If you turn the dial to number 0, that effectively turns the fridge off. Setting the dial to 9, the refrigerator will be working at its max capability. Your personal temperature setting will depend on how much food is kept in the refrigerator. If your fridge is packed with food, it needs to be on a higher number setting to maintain a low (colder) temperature. The temperature controller dial or slider on your refrigerator is a thermostat. It kicks the compressor on when the refrigerator is not cold enough. The refrigerator then turns the compressor off when the desired temperature has been reached. The more food you have in your refrigerator, the more stable the temperature will be. Set the thermostat to the middle of its range and leave it for 12 to 24 hours. Where Should My Refrigerator Controls Be Set At? If you have seen refrigerator temperature controls that are completely different from the types we have mentioned above, please leave a comment below to advise our other readers having the same issue. I have a Frigidaire refrigerator and I can’t find the temperature controls anywhere. It is top freezer model. I looked at the manual but still can’t find the control. I have a Samsung fridge freezer with digital inverter temp ? Can someone tell me what is coldest setting ? What is the warmer temp on my Freezer?? And what is coldest temp on my fridge ?? My refrigerator temperature control only have cold and colder (green n white colour) Which one should I use to get the actual temperature? I have a beko frost free (it’s supposed to be frost free) fridge freezer today I decided to have a go at cleaning drain pipe as I was getting ice frost buildup in back of fridge even tho I only have it set at say 3 there’s 1-6 and a min max as well so using bicarbonate of soda I put a teaspoon in drain hole and poured 2+mugs of hot water to flush pipe through u wouldn’t believe the amount of gunk that came out luckily I’d had the foresight to place the end of drain tube into a large bottle I’d also noticed that the drain pipe wasn’t even connected fitted drain hole in back of fridge so I fitted it as best as I could everything seems to function but I’m still getting frost ice in back of fridge door seals seem ok I’ve turned fridge down to min. Dials numbered 1 to 9. If the default is 5, by how how many degrees is the temp changed in the freezer and in the fridge by moving the dial by 1 number in the freezer and in the fridge? What is setting 1 equivalent to in degrees Fahrenheit in the freezer and in the fridge? Likewise setting 9 equivalency? I have a Whirlpool Gold refrigerator-on-top, freezer-on-bottom. The ice cream in my freezer seems to hard, but I have it set on “1.” “Off” is right next to the “1” setting, so I figured this was the lowest/warmest setting. Just seems weird my ice cream is hard as a rock. FYI, the refrigerator above is set at “4.” I’ve owned this refrigerator since 2001, so 17 years. Has run fine. I’m just relieved that I’m not the only one who is baffled when I go to adjust the temp on every fridge I’ve ever owned or used! Initially I think I know exactly what the labels mean (my 1st instinct is correct). And I struggle between whether 1 is the coldest setting since it’s the lowest # or is 5 the lowest? I think manufacturers could have done a lot better job with clarity on the labeling (ridiculous to need a manual or Google every time I need to adjust the temp) and it seems like newer fridges have done that. In the meantime I think a Post-It note inside my fridge will come in handy till it is time for a newer model fridge. I have a old side by side refrigerator from 2000. It has slider controls numbered from 0-9 what number is colder? The higher the number the colder the fridge, therefore 9 would be the coldest setting and 0 the warmest. If the controller is a thermostat, it should trigger when the temperature inside gets too warm. So why does it need to be changed for summer vs winter ? is it because the temperature is uneven in a fridge and so where the thermostat is, it needs to be colder in summer? I have a Whirlpool WRNA232 refrigerator. 7 days ago we’ve changed the timer and bought the same brand one but after 2 days the top level got froze and fresh food compartment didn’t flow air. It’s very slow air movement in the fresh food compartment. I set both the temperature control to middle level but the problem continues. Check to see if there is any blockage that is preventing the air from flowing as designed. It could be frozen and covered with ice. Try defrosting the fridge and go from there. I have a new whirlpool side by side. model wrs325fda 0. I set the refrigerator on the center position two weeks ago. at first it seemed ok. now it gets too warm/ and my fridge is in the danger zone in the 40 degrees. If I turn it to colder 3/4 or more it will stay in the safe zone. This does not seem normal to me. I think it should be cold to the point of being safe at the medium setting. Am I wrong? I have a 4 month old Whirlpool refrigerator that has ‘snowflakes’ rather than numbers on the dial. It’s not cold enough but I have no idea which direction to turn the dial to make it colder. The manual is no help at all. It was factory set at 3 snowflakes but the temperature is routinely around 42 degrees or sometimes higher. Do I set the dial to 4 snowflakes or 2? Try turning the knob up “higher” or to a larger number or more snowflakes to make the fridge colder. I have purchased a used Whirlpool chest freezer, no model number, it’s working but does freeze up. My fridge is currently on zero but it freezes everything on top. it has dial ranges from 0-7, please assist. My Hitachi (110v) table top refrigerator (weighs about 25kg) has a separate chamber for freezer and fridge. But the freezer cannot solidify a 1.5 liter bottle of water alone in a period of 5 hours. My Hotpoint fridge has no numbers, just a fan symbol. How to adjust it? It is too cold! What is the model number of your Hotpoint fridge? My GE has no numbers on dial…where to set it..in the middle keeps fridge on 40…should I turn to right or left for colder? if colder ice builds up around fan in freezer. My 1989 Kenmore freezer on top has: Freezer manual control of hinged door allowing control of how much cold air drops down from the freezer; with flashlight you can see door wide open 1 and closed down 4. Refrigerator thermostat control determines how long compressor runs where 0 = off and 4 = wide open coldest. My wife’s Aritson-Hotpoint refrigerator’s freezer knob is stuck at “S” and it wont budge. It has graduations from 1 to 5 and then S.
Could you please advise on how to go about this problem? If the freezer knob is stuck, you can try unplugging the refrigerator/freezer and removing the knob and temp control assembly to see if it needs to be replaced or can be repaired. It may just have gunk stuck in it and therefore will not turn or it may have failed and needs to be replaced. I have a whirlpool refrigerator and freezer side by side and the control are A B C which one is better? For side-by-side Whirlpool refrigerators, A is coldest, B is medium, and C is warmer usually. If you can give us the model number we can tell you for sure. My Maytag refrigerator shows 1 asterisk up to 5 asterisks. Which is the colder setting? 5 asterisks on your Maytag refrigerator should be the COLDEST SETTING. Just replaced the cold control on our 1996 Admiral side by side frig. Originally not staying cold enough and things thawing out. Replaced cold control and now stays too cold and stuff freezing even in fridge area despite setting. Cold control will turn fridge off when I turn it to the off setting but seems to be no adjustment when trying to set coldness. Compressor will shut off so I don’t think its a run on compressor. The cold control on your Admiral refrigerator may be faulty or installed wrong if now it is ultra cold and it has no ability to control temp. Check the wiring. Is the part you replaced universal or OEM? There are only two wires so i don’t think i could have mis-wired it. It is a universal part. Any way to tell if cold control is faulty? Put a multimeter on it and check to be sure it is working properly. It may also have something to do with the wiring going from there to the main control. Troubleshoot to find the issue. I have a 19 year old Fisher & Paykel. The temperature control is dual. It has 0 to 7 plus two thermometers. One is with the mercury right to the top is at the 0 end, and the other is with the mercury right at the bottom is at the 7 end.. So, Is the mercury right to the top indicating that is the coldest or the warmest. Very ambiguous. I just replace a fan in my freezer. I set my temp setting to 3 (5 coldest) , the temperature in the frig reached 40 degree F. Then I set the temp setting to 5 coldest, the temperature in the frig dropped to 38 degree F (which is OK). 1. if I turn back the temp to 3, does the temp still keep the temperature 38 degree F? 2. Keeping at 5, does it damage the compressor fast. After replacing any part in your fridge, you may need to give it a little extra time to get to temp… Either way if you put the temp setting at 3, it should level out and be okay. Keeping the temp setting at 5 does make the compressor work more but should not be a factor. Keep the temp setting at the number you need to keep your food at the “right” temp. Try going back to temp setting 3 and make sure the fridge gets and STAYS at the temp you desire. I’ve just moved into a new apartment and even with the temp setting on 0, effectively off my food etc is still freezing. Any ideas what the problem could be and/or how to fix this? It may be possible your fridge temp setting of 0 is coldest and 9 is the opposite. That is unlikely but may be possible. What make and model fridge is it? How old is the fridge? If you are in an apartment, you should be able to call maintenance and have them look at it. The temp dial may be malfunctioning and the complete temp assembly may need replaced. Does changing the refrigerator temperature settings too often cause damage the refrigerator? No, changing the temp on your fridge often will not damage your refrigerator. Just allow 24 hours each time you adjust the refrigerator temp controls for the temperature to stabilize.